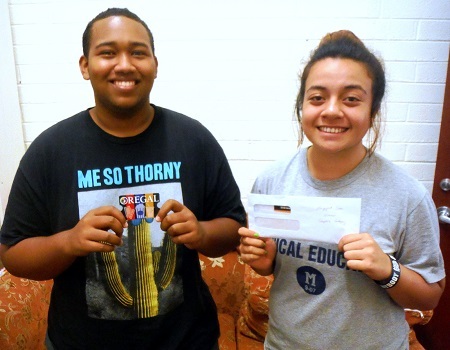 The American Samoa College Research Foundation (ASCRF) Student Organization at the American Samoa Community College (ASCC) has announced the winners in this semester’s “Biggest Loser” competition. In recognition of Healthy Weight Awareness Month earlier this year, the ASCRF launched the “Biggest Loser” competition in late January to encourage ASCC students to become familiar with the many factors in achieving and maintaining a healthy body weight. 34 individuals entered the competition to see who could lose the most weight over the next two months, with the winners emerging as James Maae in the individual category, and Avea Lotoaso and Manu Thomas taking top honors in the couple category. While the idea for the “Biggest Loser” competition came from its television namesake, the ASCC version incorporated the expertise of the fitness and nutrition specialists of its Community & Natural Resources (CNR) division to make the process of weight loss much more than simply a matter of weighing-in at the beginning and at the end. The first weigh-in took place in late January at CNR, and the contestants learned how their weight corresponded to their Body Fat Percentage and Body Mass Index. Following the initial weigh-in, the competitors were invited to two workshops given by CNR staff members Ursula Te’o-Martin, Exercise Physiologist; Travis Fleming, Community Nutritionist and Registered Dietitian; and Ryan Taifane, Fitness Specialist. The first was a Nutrition workshop where Fleming discussed the different food groups, portion control, and the importance of a healthy diet to compliment an exercise program. Next, Te’o-Martin and Taifane offered a workshop on Exercise vs. Physical Activity, which addressed the five components of fitness: cardiovascular endurance, muscular strength, muscular endurance, flexibility and body composition. “We also conducted equipment orientation for the students in the Wellness Center so they would be informed on how to use the various cardiovascular equipment safe and effectively,” said Te’o-Martin. On behalf of the ASCRF, Director Mrs. Matesina Willis thanked their CNR partners and congratulated the competition winners. “We would like to hold another ‘Biggest Loser’ competition in the future,” she said, “and possibly get our ASCC faculty and staff involved as well.” Willis credits ASCRF Administrative Assistant Tiare Tupua for coordinating the competition and the ASCRF Ambassadors for their promoting the event.